Home / غير مصنف / CANCEL BREXIT: Brexit petition update - will Britain EVER leave the EU? CANCEL BREXIT: Brexit petition update - will Britain EVER leave the EU? The petition calls on the Government to “revoke Article 50 and remain in the EU.” At the time of writing it had gathered 5,562,140 signatures from across the UK. As the petition ratcheted up signatures over the weekend, an estimated one million people took to the streets of London to march for a ‘people’s vote’ on Brexit. The original Brexit deadline of March 29 is a thing of the past, with the Government in the process of preparing legislation to officially move the mark. Now, we’re looking at May 22 at the latest - and that’s only if Theresa May can get her deal through the House of Commons, which she said herself doesn’t look likely. If the deal isn’t voted through, the UK is looking at an April 12 deadline and a no deal Brexit. Speaking to MPs in the Commons on Monday, the Prime Minister said the "default outcome" remained to leave the EU without a deal. "The alternative is to pursue a different form of Brexit or a second referendum. “But the bottom line remains: if the House does not approve the withdrawal agreement this week and is not prepared to countenance leaving without a deal, we would have to seek a longer extension." MPs voted to rule out a no deal scenario in a series of votes held in the Commons earlier this month. In 2018, the European Court of Justice ruled that the UK could unilaterally revoke Article 50 and stay in the EU. However it is extremely unlikely for this action to be taken without another referendum or some form of public vote. 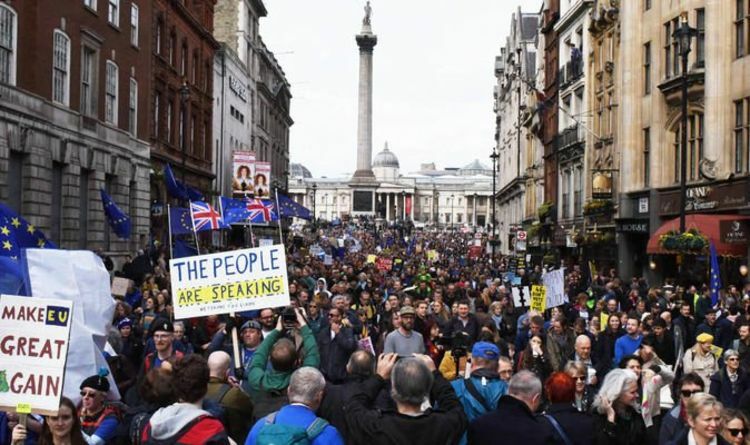 Meanwhile, organisers of the Put It To The People march celebrated more than a million people turning out on Saturday to protest through the streets of London. If these estimates are correct, it would make it the biggest march of the century, on par with the Stop the War march of 2003. He said he had this message for her: "I can only vote for a deal if you let the people vote on it too. “Prime Minister, you've lost control of this process, you're plunging the country into chaos, let the people take control."